Three decades after they released their debut album, MENTAL AS ANYTHING are still around, thank goodness. Even the most mundane Mentals track is better than half the stuff out there... not that there are many mundane Mentals tracks to begin with! Just out is their BRAND NEW album, Tents Up, and here's what I had to say about it on All Music Guide!
" On August 16th, 1977, Elvis Presley died. On that same day, in Australia, Mental As Anything played their first gig. So, here it is, 32 years later and the Mentals are still touring and releasing new music, but things have changed. At the beginning of the millennium, bassist Peter O’Doherty and guitarist Reg Mombassa left the band, the first Mentals line-up change in over two decades. Following 2001’s uneven Beetroot Stains album, drummer Dave Twohill was ousted from the band and vocalist/guitarist Martin Plaza and keyboardist/vocalist Greedy Smith remained the Mentals’ only original members. Their next release, Roadcase in 2002, suffered the same unfocused fate as the previous year’s album. The band began to slowly recover by issuing Plucked in 2005, an album of acoustic renditions of their past hits, and they continued to tour. 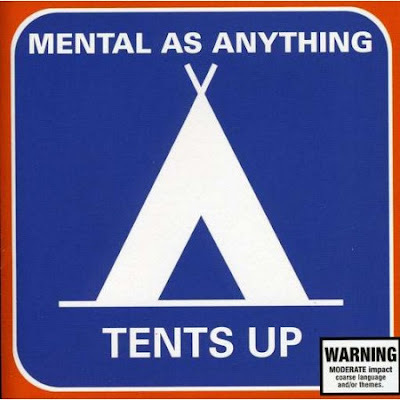 Now, seven years after their last real studio album, the band returns with Tents Up, an album that may not return them to their glory days (’81-’85), but is certainly their best album since 1995’s Liar Liar Pants On Fire. Martin and Greedy remain masters of the pop song, able to knock out wonderful melodies and make it sound so damn easy. While there doesn’t seem to be a bonafide modern Top 40 chart hit on the album, that’s only because the band are sticking to their guns and recording a Mental As Anything album and, for the first time in a decade, aren’t trying to mess with the formula. “Moaning Lisa”, “Covered In Women”, “Lazy”, “She Could’ve Been Mine”, “Blues Guys” and “Karaoke Hostess” are all worthy additions to the band’s vast catalog. On the band’s two previous studio albums, ‘new’ recruit David ‘Duck’ Barraclough was allowed to contribute songs and, while he was obviously talented, his style didn’t fit the typical Mentals sound. On Tents Up, his contributions (“I Know You Will” and “Easy”) fit quite nicely into the Mentals mix and are also standouts on the album. While the band are not as musically playful as they were on albums like Cats & Dogs and Creatures Of Leisure, they make up for it lyrically with plenty of witty moments that hold up over repeated listens (“Loving you is like a rodeo/Bucking hard all the time”). Old mate Reg turns up to play guitar on a few tracks, sounding as great as ever (he’s now in Dog Trumpet with O’Doherty, his brother). I must admit that, on first listen, the album sounded a bit too safe, but it really opens up after a few spins and takes the listener for a fun ride. Welcome back, Mental As Anything!"